Download "The Times They Are A Changin'"
Billy had been a fan of Bob Dylan as a teen, and signed with Columbia Records in the early 1970s rather than Atlantic Records in part because Dylan was on Columbia. So it was natural that Billy performed Dylan's classic song "The Times They Are A Changin'" while in Russia in 1987. When Dylan released the song back in the 1960s in the United States, it perfectly captured the changing cultural and political climate of the United States including the Civil Rights movement and Free Speech movement. Billy aptly saw that something similar was happening in Russia at the time. As Rolling Stone reported: "Every night, he performed a cover of Bob Dylan's 'The Times They Are-A Changin'' and gave a speech (with the aid of a translator) about the song. 'I have a feeling that what's going on in your country right now is very much like the 1960s," he said one night. "This song has been going around and around my head since I've been here.'" 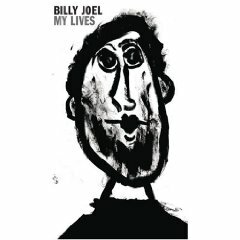 Ten years later, in 1997, Billy would cover another Dylan tune, "To Make You Feel My Love" on Billy's Greatest Hits, Volume III. Billy's version actually was released before Dylan's own version. Billy has also recorded Dylan's "Highway 61 Revisited" on My Lives. 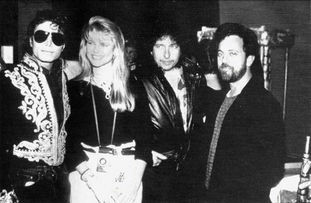 Michael Jackson, Christie Brinkley, Bob Dylan and Billy Joel at the recording of "We Are The World" (1985). Photo: Sam Emerson. Copyright © 1963, 1964 by Warner Bros. Inc.; renewed 1991, 1992 by Special Rider Music. Billy performs the Bob Dylan song "The Times They Are A Changin'" on Russian television in 1987. It was the perfect song for the moment and time. Bob Dylan performing "The Times They Are A Changin'" on U.S. television in 1964. Billy performs Dylan's "To Make You Feel My Love" and discusses the time Dylan came to Billy's home with his daughter who was a fan of Billy's music, from Late Night with David Letterman (1997).